We’re always looking for ways to improve the Faast user experience. If you’ve connected to Faast recently, you’ve probably noticed the user interface looks a little different than it used to. That’s because we’ve added some new features which are designed to give you a more comprehensive overview of what’s happening in the market and how you can position yourself for success with cryptocurrency. When you connect your wallet to Faast, you will notice there is now new information displayed on the lefthand side. 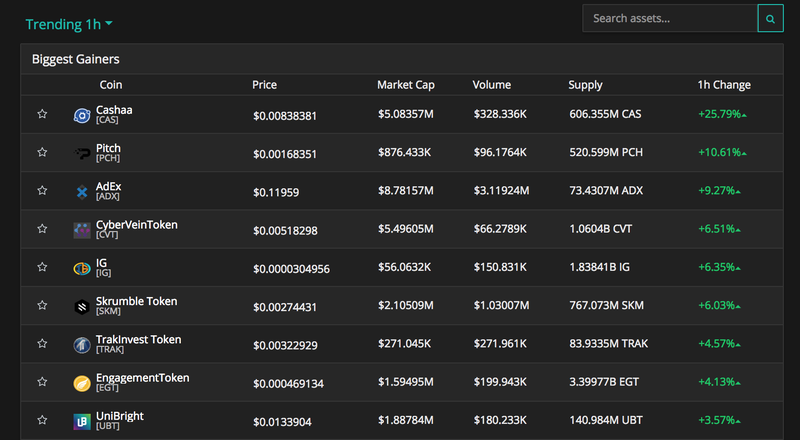 Previously, there was simply a dropdown menu of all your connected wallets, which allowed you to toggle between them and see the holdings displayed graphically. This feature is still there— you simply click the “My Portfolio” text to open the new drop-down menu of your wallet. Below this is where all the exciting new bells and whistles are. You will notice that there are now three different buttons below the total USD amount in your wallet. 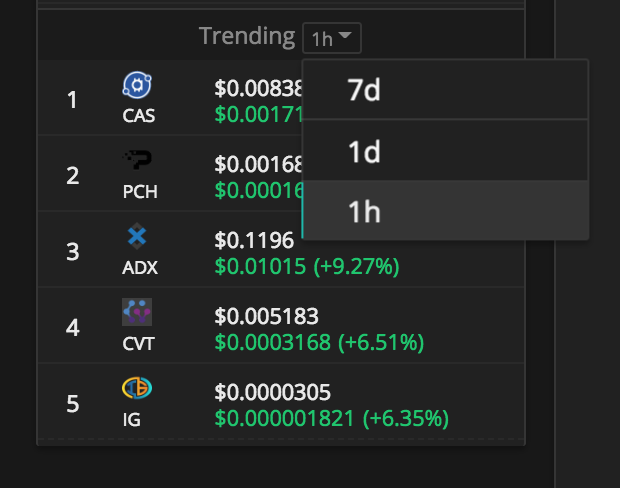 These allow you to see how your portfolio or currently selected wallet has performed over the past 7 days, 24 hours, or 1 hour. Things change at breakneck speed in the crypto world, and the 1 hour feature will prove especially important for staying on top of what’s happening in the market. Below this is the Watchlist. These are a listing of the top assets we think you should be keeping an eye on. 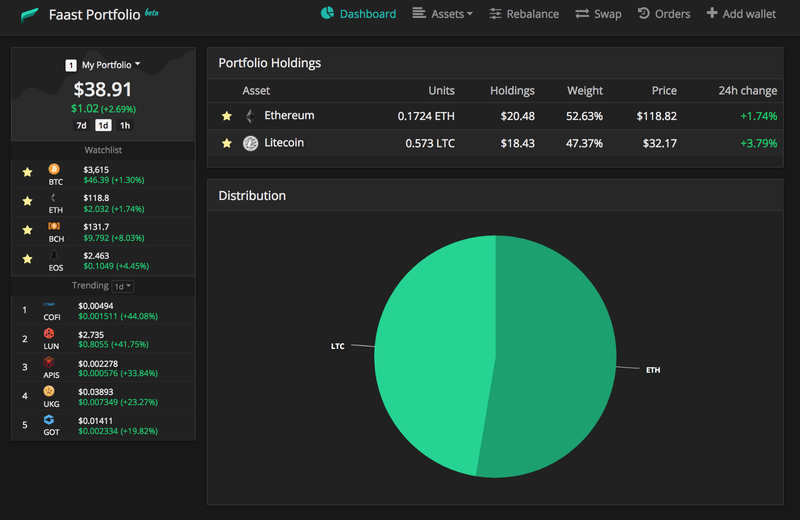 Clicking on any of these assets will take you to a new page which summarizes that assets’ long term performance, along information about market capitalization, circulating supply, 24-hour performance and more. There are also easy links allowing you to buy or sell it on Faast. 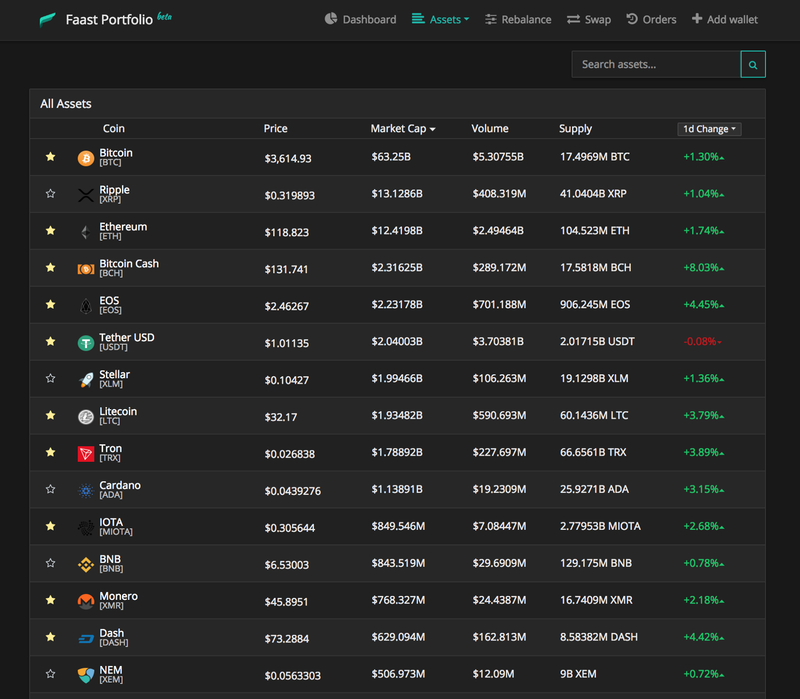 While not all cryptocurrencies listed here are supported by Faast at this time, they will be eventually. Click on assets in the Watchlist for a detailed overview. Right below the Watchlist is the new Trending assets feature. 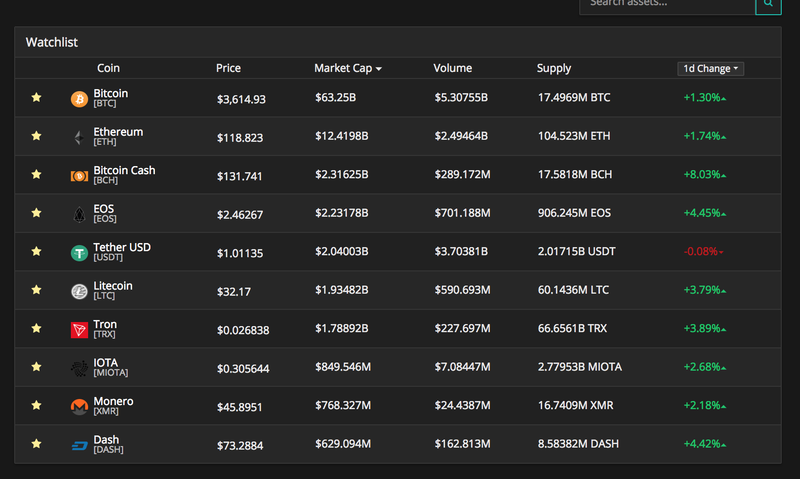 This is a summary of the of the most popular cryptocurrencies on Faast by trading volume over the last 7 days, 24 hours and1 hour. Again, this is useful for boosting your situational awareness about the market so you can better identify risks and opportunities. In the main menu at the top of the screen, you will see a new “Assets” link. This drops down into a small menu of three pages. Let’s explore the first one, simply titled “Assets”. 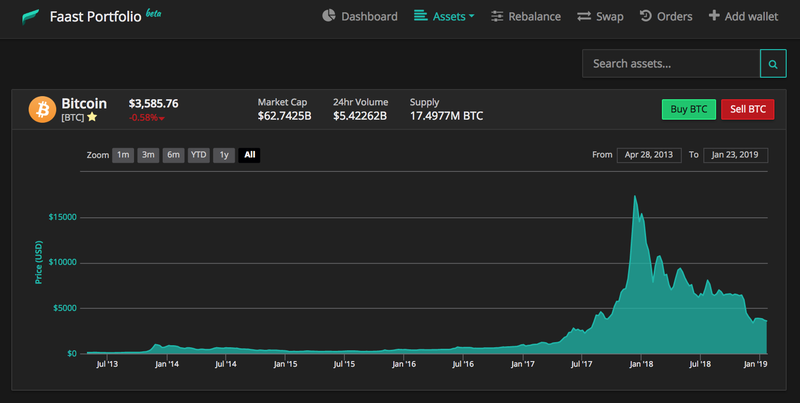 This is simply a summary of the market data you’d find on CoinMarketCap.com, designed to give you all the information you need in one place. You can see how the market as a whole has performed in the last 7 days, 24 hours, and 1 hour. Clicking on any asset will also take you the page providing a more detailed overview of that cryptocurrency. Next we have the Trending and Watchlist pages. These are more detailed explanations of what’s happening in each of these categories. Each is broken down into two categories— Biggest Gainers and Biggest Losers— which, as the names imply, explain which cryptocurrencies have gained the most in the selected timeframe, and which ones have experienced the biggest price declines. Why bother adding all this? Because we want to arm our users with not only the best tools for building an exceptional crypto portfolio, but the best information as well. It’s all part of our ongoing commitment to building the best crypto swapping tools available to the public. Try it out today and see for yourself why Faast is what the future of crypto looks like.